Before Memorial Day: Apply for a DBIA Project/Team Award! Have you started gathering what you need to apply yet? Winning a Design-Build Project/Team Award will help you gain a competitive edge and stand out as an industry leader, so be sure to begin applying today. The submission deadline is May 27, just one week away! “This legislation affirms Missouri’s commitment to finding better ways to deliver construction projects for the taxpayers, and is encouraging for the future of design-build in the Midwest,” said G. William Quatman, Esq., FAIA, DBIA, who currently serves as Chairman of the National DBIA Board of Directors. Quatman is also a Missouri resident who serves as General Counsel for Burns & McDonnell Engineering Co. He has helped to write the legislation in various forms, and testify for it, since 2007. 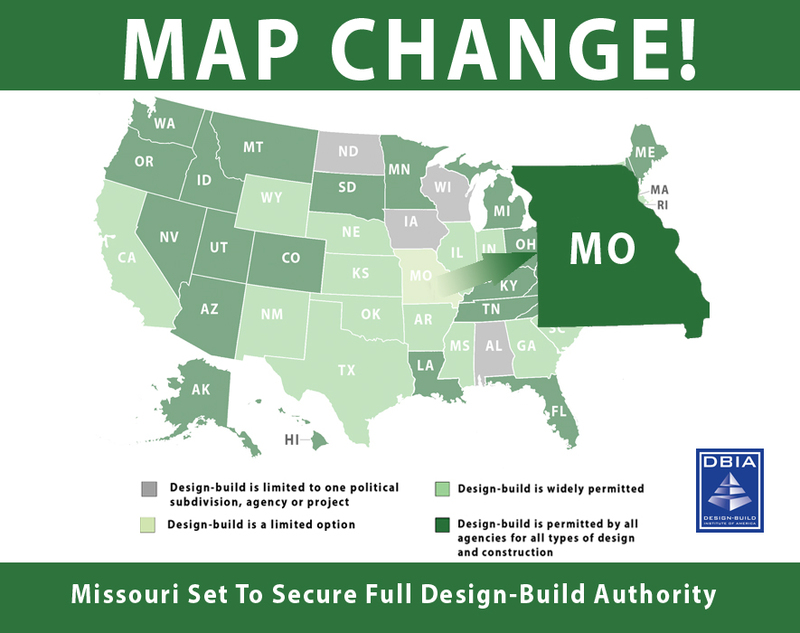 “There is a great demand for design-build on local civil, architectural and water projects in Missouri, and I applaud the members of the Missouri General Assembly for embracing this comprehensive procurement reform. I am extremely grateful for all the hard work done at both the regional and national level to see this legislation through. New Department of Labor regulations, which were last updated more than a decade ago, would let full-time salaried employees earn overtime if they make up to $47,476 a year, more than double the current threshold of $23,660 a year. About 35 percent of full-time salaried employees will be eligible for time and a half when they work extra hours under the new rule, up significantly from the 7 percent who qualify under the current threshold, according to the Labor Department. The Final Rule focuses primarily on updating the salary and compensation levels needed for Executive, Administrative and Professional workers. The bill, as amended, would impose a $3 million ceiling on the use of one-step/turnkey design-build selection procedures for civilian projects. Larger design-build projects would be required to use two-step procedures. The bill was reported favorably to the House by voice vote. Crumbling and deteriorating roads, bridges and railways are usually the things you hear about when it comes to our country’s infrastructure challenges. It makes sense, considering we encounter these above-the-ground forms of infrastructure every day. But it’s what we can’t see and only notice when something goes wrong that often goes overlooked – this nation’s out-of-date water infrastructure. With Infrastructure Week beginning on May 16, the opportunity arises to not only bring the issue of water infrastructure vulnerabilities to the surface, but also point to the role of public-private partnerships to help find, and fund, solutions. The Associated General Contracts reports that in just FY 2015, the U.S. Army Corps of Engineers executed over 42,000 change orders and the Naval Facilities Engineering Command executed some 36,000 change orders, costing somewhere between $500 million and $1 billion. Also, 40 percent of federal construction contractors said that on average it takes 6 months to a year for a federal agency to execute a change order and pay the contractor for that work. Further, 18% of federal construction contractors said that on average it takes over 1 year for a federal agency to execute a change order and pay the contractor for that work. AGC is working to gather more data on this and are surveying the construction industry. If you have worked as a prime contractor or subcontractor for a federal agency, please consider taking this brief 15 question survey: https://www.surveymonkey.com/r/WXXKF9J. Mabey’s structural shoring fits any job, including facade retention or needling for restoration, retention or demolition projects. We also support bridge jacking and temporary bridge projects. Our equipment can handle loads from 45 – 500 kips with modular designs to makes transport, assembly and disassembly easy. All connections are bolted so no welding is necessary. See how here. The overwhelming majority of projects in the plan – 88 percent – are designed to take care of MoDOT's existing system. MoDOT said in a news release Wednesday that "changing economic conditions" make the outlook for the next five years, outlined in what's known as the statewide transportation improvement program, more robust than previous years. Those conditions include increased state revenues, predictable funding as a result of the passage of a federal transportation bill in December and MoDOT's efforts to seek federal reimbursement for preventive maintenance work, MoDOT said. Honolulu Authority for Rapid Transportation board members say there could be some drastic changes, or they will need to ask for more money. Board members say the Federal Transit Administration’s higher projected cost is in part due to the rise in construction and labor costs, as well as other unknowns the project may face. Without question the Americans with Disabilities Act has been successful in removing barriers and making spaces more accessible. But for architects and builders, it’s often challenging to combine accessibility, functionality and aesthetics. Since construction operations began in late 2013, prime contractor Tappan Zee Constructors LLC (TZC) has utilized more than 620 New York companies to help build the new twin-span bridge between Westchester and Rockland counties. Over 5,000 people have worked on the project so far. Most of the substructure work, including piles and pier columns, is now complete. Work is reportedly on track for the 2018 opening, and remains within the $3.98 billion budget. PCL Construction will serve as general contractor for the Gensler-designed, 22,000-seat stadium, which will feature a semi-transparent canopy, restaurants, retail, office and conference space, jumbo video scoreboards and a soccer museum. The stadium, which will be situated next to the Coliseum and replace the Los Angeles Sports Arena, is the most expensive "soccer-specific" project in Major League Soccer history. The city of Winnipeg, Canada, has announced the joint venture Plenary Roads Winnipeg — led by the Canadian businesses of the Plenary Group and PCL Construction — will build the second phase of the city’s $587 million transit corridor and highway underpass, the Winnipeg Free Press reported. The total undertaking is Winnipeg’s largest-ever capital project and will be a public-private partnership (P3) with the joint venture designing, building and then maintaining the project for 30 years. Who said business is slow? The tighter economy lowered net profit margins while it increased most construction business owner’s and manager’s workloads. Cutting costs, reducing staff and lowering overhead expenses kept managers busier than ever trying to get everything done for less including job meetings, customer calls, ordering materials, bidding jobs, scheduling crews, and finding time to go out and look for new business. Your choices? Do business the same way you’ve always done it, bid the same kind of jobs against too many low priced competitors, and continue to struggle. Consider these value-added services to make more money, including providing design-build or design-assist with selecting and coordinating architect and engineers. Countries around the world are showing new signs of readiness to act on carbon emissions. That means new pressures to make buildings highly efficient in their use of electrical power, particularly as a recent report from the U.S. Environmental Protection Agency shows that, between 1990 and 2013, indirect greenhouse gas emissions from electricity use of homes and businesses increased 28 percent. However, perceptions of ultra-modern, high efficiency commercial buildings may not align with the realities of the low-carbon built environment challenge. Washoe County Community Services Dept.